With Protec Recycling's on-site and pickup services, there's no need to do any heavy lifting or to utilize valuable company time and resources to clear up space - we'll bring the service you need right to your doorstep. Our expert team can professionally de-install, load, and transport away outdated and out-of-use assets, keeping your company or organization's time focused where it needs to be. We’re here to tell you that you don’t have to handle it alone. 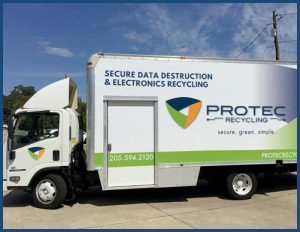 Protec Recycling offers e-waste pickup as well as on-site service! Contact Us – Call 205-549-2120 or Contact Us online if you need more information – when you’re feeling ready to schedule, you can also contact us via phone or you can use our convenient On-Site Pickup Form. Pick-Up – Once your pickup time has been scheduled, we will arrive at the agreed upon time to actually handle the job! We pack, palletize, load, and transport the items for further processing. We also offer clean and professional De-Installation of old assets! Sort – Once everything has been collected and loaded up, we then bring the items back to our own facility to further evaluate them. Re-marketable items will be sorted from junk, and all will be sold or recycled accordingly. On-Site Data Destruction – Any data-containing devices will be properly wiped and destroyed to assure your information never falls into the wrong hands. We also offer on-site shredding of old hard drives and other data-containing devices so that you can watch sensitive information disappear for good right in front of you. Process – Most items are dismantled and separated into clean, usable materials. Steel, aluminum, plastics, and precious metals are re-used to keep them out of landfills. Usable components and items are remarketed to integrators and end-users once any data-containing parts have been properly wiped and/or removed. Don’t let old waste clutter up your storage area, and don’t run the risk of letting sensitive information fall into the wrong hands – let Protec Recycling handle your waste! Call us today at 205-549-2120 to schedule an appointment, try our convenient On-Site Pickup Form, or visit our Contact Us page.